This short blog will focus on the features of the Zero DC Speedy Belt, one of the waistbelts designed for canicross which are known as ‘nappy’ belts because of their design to cover most of your behind when worn. The Zero DC version of the ‘nappy’ belt currently comes with black, blue or red panels on the side, with the main bulk of the material being a lightweight, very comfortable and strong, black mesh. The belt remains breathable because most of its’ mass is mesh and allows a certain amount of airflow. 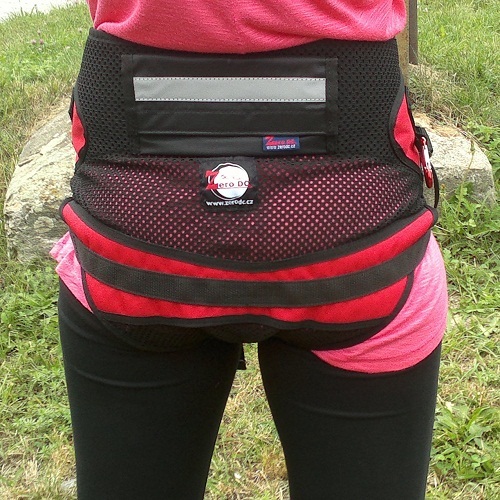 The Zero DC Speedy Belt covers most of your behind a bit like a nappy! The Speedy Belt has integrated, adjustable leg straps which clip in at an angle at the front of the belt and ensures the belt doesn’t ride up. 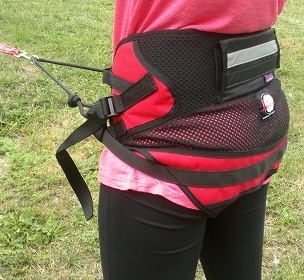 It is designed for the top section to sit low on your hips and has another clip with adjustable webbing straps across the front of your hips to hold it in place. The pulling force of your dog is directed across a thick band of webbing situated across your buttocks and has the effect of ‘lifting’ you forward, rather than just yanking you forward and therefore protecting your back from taking the brunt of the pull. Your bungee line can attach via a carabiner on the section of rope which runs from one side of your waist to the other at the front. If you don’t have a carabiner or quick release clip, you can simply loop your line through itself, although this doesn’t have the benefit of quick release. The advantage of having the rope at the front of the belt is that your line will slide along this if you’re turning a sharp corner, thereby making the ‘cannonball’ effect of being attached to a strong dog hauling you around a corner, less of a problem. Finally, the Speedy Belt has a practical pocket with a large reflective band sewn to the back of the belt, which can accommodate keys, poo bags or a phone when running. I have been using this belt to run all three of my dogs for over a year now and I highly recommend it because of it’s design and features. The pulling force being directed much lower is a must if you have strong towing dogs and I find having extra material to help spread the tug really helps to keep me comfortable. It is lightweight enough to be worn racing but tough enough to be used throughout the year when training. 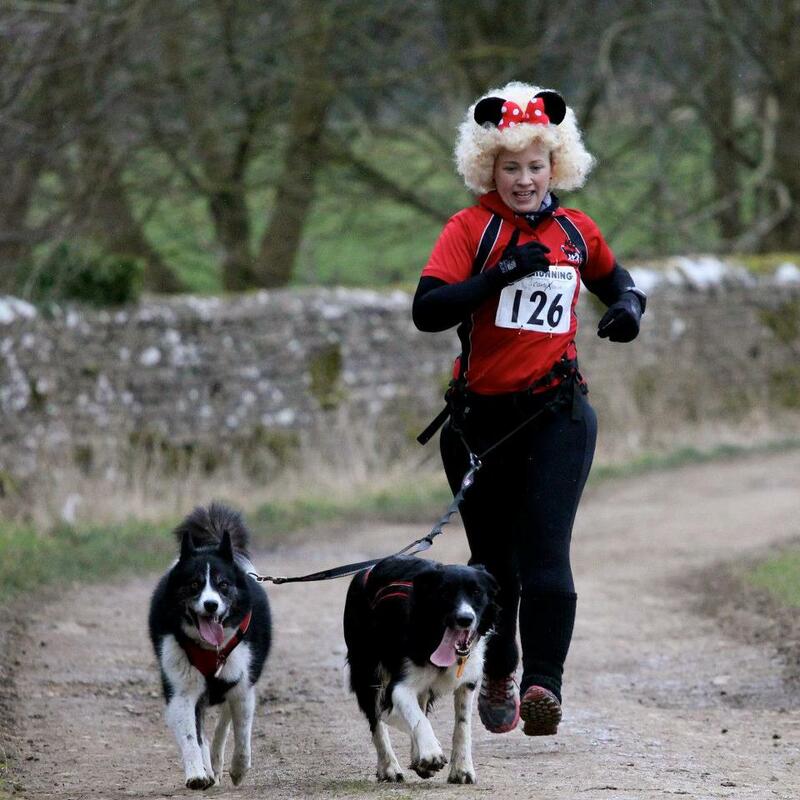 In conclusion, a great option for a canicross belt if you don’t mind the ‘nappy’ look! 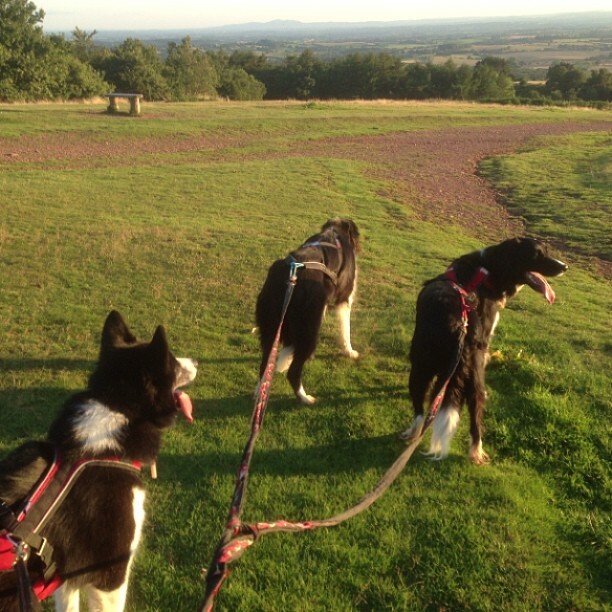 I wanted to write a short blog on injuries and recovery, not that I am an expert in any way, shape, or form but both myself and my dogs have suffered various injuries over the years, as you would expect having been competing for 5 seasons now. This is from a very personal and non-medical perspective and is really just my thoughts on how I have managed the problems I have encountered. 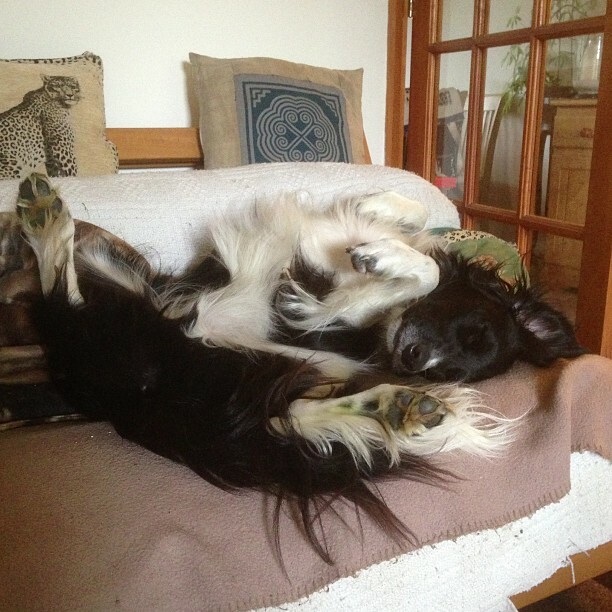 Firstly, the main thing to do is accept you may have to rest, either yourself or your dog, as with any injury one of the first things to do is to rest the problem. Now I am not as good at doing this, as I am enforcing it for my dogs but I have had a few periods of complete rest during the last 5 years. Secondly, get a professional opinion. There is no point guessing what your injury is, or the best way to treat it. If you have a reliable professional you can trust, take yourself to them and listen to their advice. I regularly take my dogs to see a canine massage therapist for a general muscular check up. I am lucky in that I have a great professional network around me for my dogs, so they have never had prolonged periods of rest. I only wish the same could be said for myself! Keep active. If you have to stop canicrossing or bikejoring then don’t forego all activity as a result. Find other things to keep you moving. A perfect example of this is swimming. I personally hate swimming, unless it is in a warm country with a cold drink waiting for me when I get out. I did resort to membership of my local sports centre when I tore the ligaments in my ankles however, and as much as I moaned about the experience, at least I felt like I was doing something to actively recover. 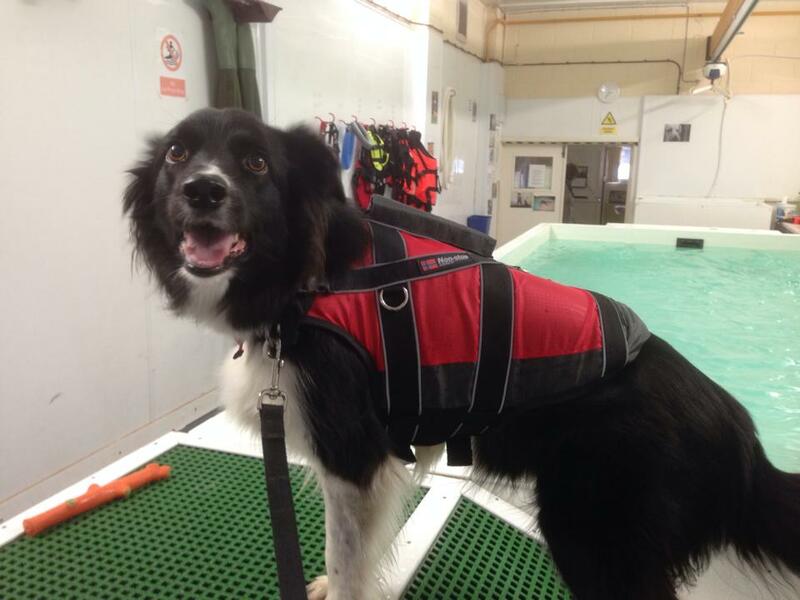 More recently, one of my dogs had a cruciate strain and a course of hydrotherapy safely build up his strength, so that when he could begin canicrossing again, he was still fit and strong. Keep healthy. Having to rest or change your routine is no excuse to start eating rubbish food or ignore your normal diet. Although it may be a comfort to you to indulge in extra treats while you feel sorry for yourself, you will regret it when the time comes to start training again. I have even reduced the amount of food both myself and my dogs are consuming in an effort not to put strain on our bodies (and possibly the injury). It is not easy and I’m not saying that I’ve never let myself put on a few extra pounds when I’ve been injured, just that you need to be mindful of making recovery as easy for yourself as possible. You might also want to consider supplements in your own or your dogs’ diet to help support an active lifestyle, as there are a number of great products on the market now. Keep positive. I have had periods where I felt like thing weren’t getting any better but in actual fact they were. There is a lot to be said for the power of positive thought and I firmly believe that those who deal with injury in a positive way, recover quicker. My eldest dog was diagnosed with arthritis when she was just 5 years old but we’re nearly 3 years on now and after some initial treatment, we bought her a magnotherapy collar and under the advice of the vet, continued her programme of canicross. Today she is fitter than she has ever been and although I realise there will come a time when she will want to slow down, she is enjoying life far more being included in all our activity then she would if I had just retired her. Keep positive and you’ll be back out there before you know it! To conclude, whatever injury you or your dog have suffered, there are usually options available to you to allow you to continue activity of some description, until you have fully recovered and can get back to your usual routine. It is important to take advice, keep positive and healthy and hopefully you will soon be healed enough to get out enjoying yourself again. 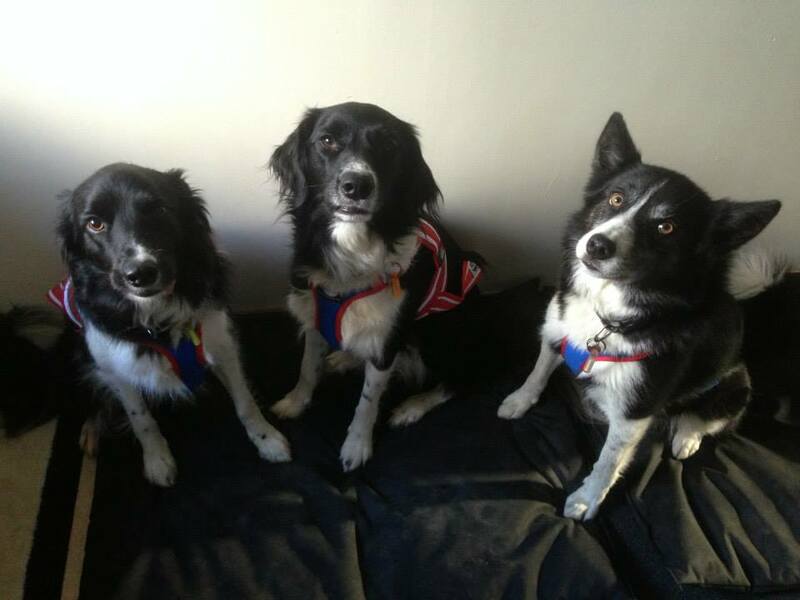 This is a short blog to give you 5 great reasons to get out canicrossing with your dog – now! 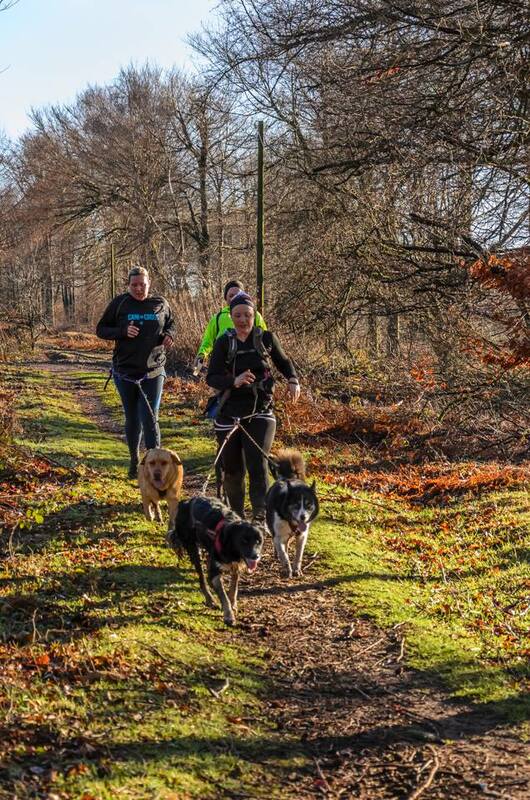 1 – Your dog will be happier and calmer after a canicross run – studies have shown that dog behaviour improves if your dog is getting the correct exercise. 2 – You will burn off that cookie you had after lunch – depending on your height, weight and how fast you run, you burn approximately 100 calories per mile, so 2.5 miles burns off the average chocolate bar, a pint of lager or a glass of wine! 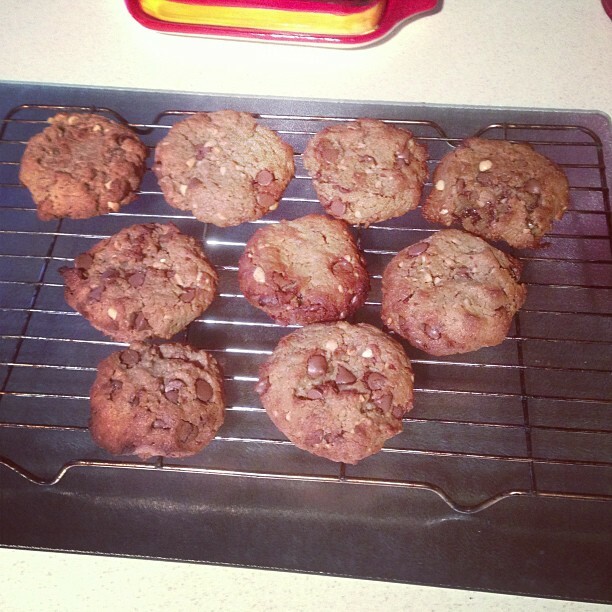 Burn off those cookies by canicrossing! 3 – Regular exercise prolongs the life of you and your dog – it is well known that by taking 30 minutes of moderate exercise 5 times a week you can reduce the risk of heart disease and certain types of cancer, this applies to you both. 4 – You will be improving your mental health – research has shown that running not only triggers the chemical release of endorphins but can boost cognitive function too. 5 – By canicrossing with your dog, you can achieve two things at once – why go to the gym and then walk the dog when you get home? 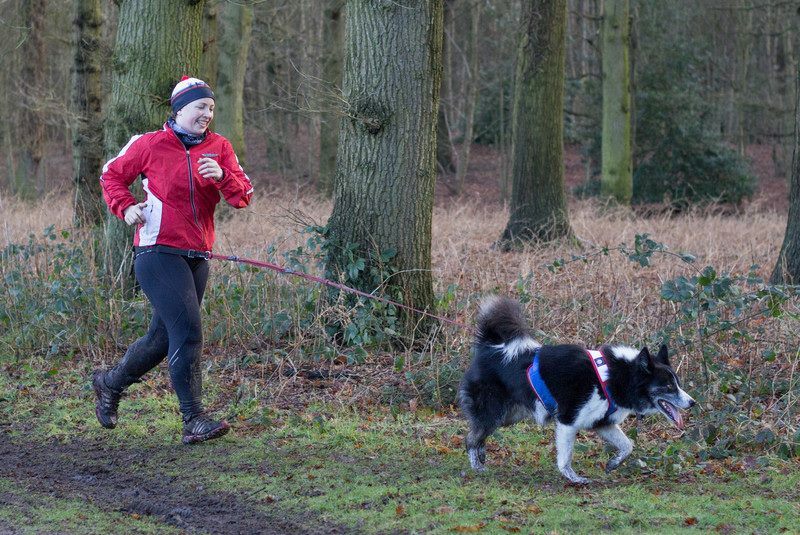 Canicross is exercise for you and your dog, keeping you both fit, healthy and active.